After a long journey Rose is about to be reunited with her husband. Emmet was never her great love, but Rose needed the security of marriage and a family. Emmet traveled to Sacramento and bought the River Queen Hotel, a den of inequity, a shady hotel that's the place to be for gamblers, drunks and prostitutes. Because of the gold rush there are plenty of customers and there's a lot of money to be made. However, just before Rose's arrival Emmet unexpectedly dies. Because of new laws Rose inherits everything he's left behind. She has to fight her in-laws for it, but Rose is determined to run the hotel and turn it into a respectable and successful place. Rose stumbles upon all kinds of trouble. Hardly anybody expects a woman to run a business by herself. She has employees she can't trust and there are people who are living in her building she can't just throw out. She's determined to overcome each obstacle though. With a little help from new friends and employees she has to build a reputation. Will Rose be able to pull it off and will her hotel indeed become the fine and well loved establishment she envisions? River Queen Rose is a wonderful story. I was immediately captivated by Rose. She's strong, capable and smart. She knows what she wants and isn't afraid to speak her mind. This sometimes leads to trouble, but eventually it gets her far. I greatly admired how she listens to her heart, is gentle, kind and caring and fights for what she believes in. She's a truly magnificent main character and I loved every single page of her story. I read it in one sitting and couldn't put it down. Shirley Kennedy has a fabulous enchanting writing style. I really enjoyed reading about Rose's adventures. Every day brings something new and Shirley Kennedy's vivid descriptions are making the story come to life incredibly well. I liked that River Queen Rose is a book about love, family, business and friendship. It's versatile and multilayered. Rose has many battles to fight and she doesn't back down. She's an amazing fierce woman who deserves love and happiness in her future. Finding out if she'd get it kept me on the edge of my seat. I absolutely adored River Queen Rose, it's a brilliant mesmerizing story. If you love historical fiction with strong heroines, you don't want to miss River Queen Rose. She began her writing career with traditional Regency Romances published by both Ballantine and Signet. Currently she’s writing what she loves best: western historical romances for Kensington Lyrical Press. She spent ten years living in Calgary, Alberta, Canada, and has a BSc degree in Computer Sciences from the University of Calgary. Originally from Fresno, California, she has resided in Las Vegas for several years. 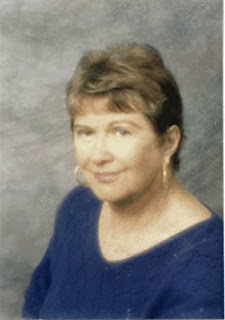 She's an active member of The Romance Writers of America, Las Vegas Chapter. For a list of her books, visit her Amazon Author Page. I’ve always loved history, so not surprisingly my first published novel, Lady Semple’s Secret, took place during England’s Regency Period. Officially, the Regency lasted only from 1811 to 1820, but what with its beautiful fashions, manners and morals, achievements in the fine arts and architecture, Battle of Waterloo, antics of that rogue-in-chief, the Prince Regent, I had loads of material. But after six more Regencies, burnout! I ran dry on drawing room dramas, daring duchesses and dashing dukes. Time to move on. Born and raised in the West, it’s no surprise I chose Western Historical Romances as my new genre. My next books involved wagon trains headed west on the Overland Trail. So many catastrophes could happen on a wagon train: dangerous river crossings, poisonous snakes, buffalo stampedes, Indian attacks, accidental shootings, deadly diseases, and more. I wrote four novels about wagon trains before—not burnout, exactly, but I couldn’t face another covered wagon making that perilous journey to the golden land. 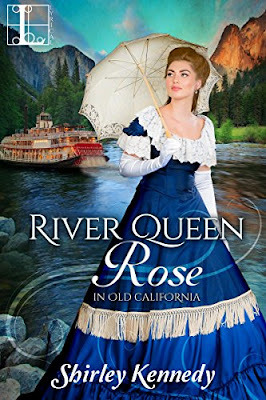 River Queen Rose takes place during the Gold Rush in the rip-roaring mining town of Sacramento. The historic River Front and the tragic explosion of a paddlewheel steamboat play a prominent part in the story. Bay City Belle features 1870 San Francisco and the wild Barbary Coast. Almost all incidents in my novels are based on fact, and I thoroughly research each one. That’s part of the fun. Plenty of material is available for notable historic events, but the small stuff can be hard to find, e.g., in 1812 were the streets of London lit by gaslight? (Only a few). In 1870 did San Francisco have indoor plumbing? (Yes). Hot running water? (Yes). In 1870, could my heroine send a collect telegram? (No). What next? I may be a Regency writer dropout, but I’ve found my niche with western historicals and I’m not done yet. Stay tuned for more and Happy Reading! One very lucky reader of With Love for Books will receive a $25 Amazon gift card from Shirley Kennedy. What a gorgeous blue that dress is. The cover reminds me of that wonderful old film 'Show Boat', with my grandmother's favourite singer Paul Robson. River Queen Rose sounds like an action packed historical romance set during the California Gold Rush period. This sounds like an excellent book! Im so excited to try it. Rose sounds like a determined, admirable character! Looks like a lovely read, great cover too. Sounds like a lovely read, thank you for the giveaway! Her dress on the cover is fantastic! I love the cover especially that dress. Thank you so much for this giveaway! I'd love to have the chance to read your new book in the future! Thanks so much for a great review and the giveaway as well. Great Post! I'm loving this cover too. Sounds like a great read. Love the cover! I love a heroine who speaks her mind, so this story sounds really good to me. Love historical read and the River Queen Rose is right up my alley. It sounds like a great story, my kind of read.Thank you for sharing it. I enjoy historical fiction. The River Queen Rose sounds interesting! I love to read books about the Old West. This should be a good one since it's written by an actual Westerner. This sounds like an interesting book. I like historical fiction and storng female lead characters! I love the cover! She looks so beautiful. Congrats on the book! The dress in that cover is just gorgeous. Not sure if I'll read it, not a genre I read heavily but it looks cute. The cover is really lovely. Sounds like a great page turner. Love books with strong female characters and the "den of iniquity" theme sounds great. What a sweet cover love it. I would like to give thanks for all your really great writings, including River Queen Rose. I wish the best in keeping up the good work in the future. What a fabulous guest post, I thoroughly enjoyed how you described moving from one period to the next. I had a chuckle when I read "one of my characters meets a sad fate in the jaws of a crocodile. (Note: this was not a nice person.)" I also loved the details that you discovered through research about gaslight, indoor plumbing, hot running water and telegrams.